Administered by the Congress for the New Urbanism, the Charter Awards program rewards the best work of the new era of placemaking. Every year since 2001, CNU has convened a jury of the highest caliber to review submissions and select winning entries that best embody and advance the principles of the Charter of the New Urbanism. The Charter identifies three major scales of geography for design and policy purposes. The largest scale is composed of regions. The middle scale is made up of neighborhood, districts, and corridors, and the smallest scale is composed of block, streets, and buildings. Charter Awards are given to projects at each scale, and a special recognition is reserved for the best projects at the professional and the student levels. This year, a handful of new categories were added, including Best Urban Infill, Best Planning Tool or Process, and Best Tactical Intervention. As the preeminent global award for excellence in urban design, CNU hopes the Charter Awards will set new benchmarks and new models for urbanism worldwide. 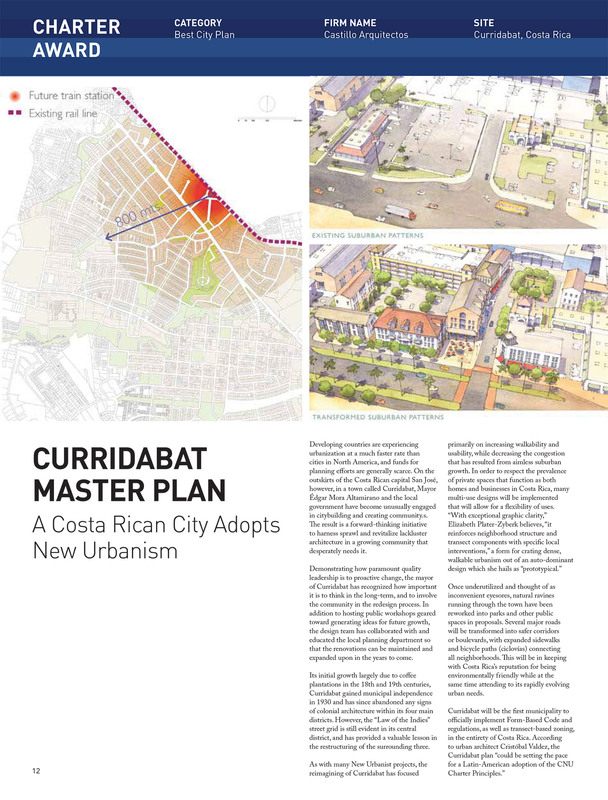 The Master Plan for Curridabat, Costa Rica, won this year’s Charter Award for Best City Plan. Led by Castillo Arquitectos, PlusUrbia is proud to have collaborated on this outstanding project. The Congress for the New Urbanism (CNU) is the leading organization promoting walkable, mixed-use neighborhood and development, sustainable communities and healthier living conditions.